Investors are still concerned about a disappointing earnings report last week. Shares of Chinese electric-vehicle maker Kandi Technologies (NASDAQ:KNDI) continued their rough ride last week into this one. Kandi's stock closed at $3.50 on Monday, down 10.3% from Friday's close. Kandi did announce two new executive appointments on Monday. CFO Wang Cheng has moved to a new role as Kandi's chief strategy officer. Mei Bing, an executive with over 15 years of experience in technology and biotech firms, joins the company to take over as chief financial officer. But that's probably not the full story here. Kandi's joint venture with Chinese Automaker Geely just launched the Global Hawk K17A, an affordable battery-electric hatchback. Image source: Kandi Technologies. It's more likely that investors on Monday were reacting to a different piece of news from last week. 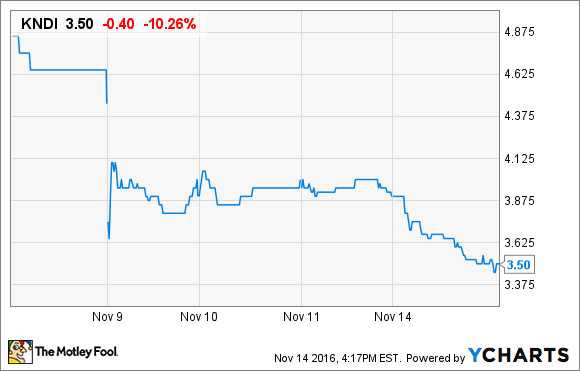 Kandi's stock has fallen off considerably since a disappointing earnings report on Nov. 9. Kandi's revenue fell over 87% from a year ago, and its bottom line swung to a $600,000 loss, after a Chinese government decision to withhold subsidies pending an investigation starved Kandi of operating capital. KNDI Price data by YCharts. As Kandi's CEO Hu Xioming explained during the company's earnings report on Nov. 9: "China's central government preceded a review on the subsidies paid to all the EV manufacturers, which caused the 2015 subsidy payments remain unpaid industrywide. The delay in subsidy payment heavily impacted the JV Company's production and sales, which resulted in a significant decrease in our EV parts sales." Five Chinese EV companies have already been fined and removed from the list of companies eligible for the government's EV subsidies, and the investigation continues. Investors continue to await word that Kandi has received its subsidies. (Among other things, that would reassure investors that Kandi isn't a target of the investigation.) Meanwhile, the company is gearing up to launch new models in 2017 and preparing for an initial public offering of its car-making joint venture.